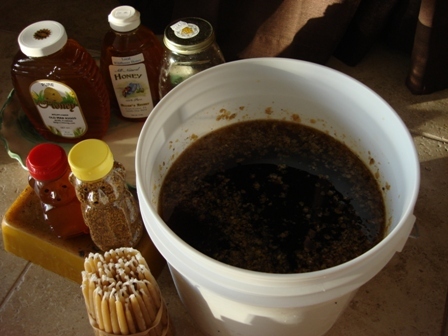 I became a backyard beekeeper because of my love for honey. I remained a backyard beekeeper because of my love for the bees. If you told me a year ago that beekeeping was in my future, I would have answered that you were crazy. Look at us now. There is something incredibly wonderful and addictive with these honeybees. They have a magnetism that can’t be explained. We only had 2 bee boxes a couple of months ago and one of them died. A swarm of bees moved into our empty bee box. We bought 2 boxes of bees from a fellow beekeeper. Now we have 4 hives. Grayson and I added a "super" on top of 2 of the hives. This is a good thing and means our bees are making lots of honey. Grayson and I are beginners in the world of honeybees. We got into beekeeping from an advertisement in our local paper. Our local beekeeping association offered a beginning class for beekeeping at our agricultural extension agency. They close the registration at thirty people. Grayson and I were the last ones to get in, we felt very lucky. We took the class… we LOVED it. They will be offering another class in the summer of 2010. Check their website at www.swfbees.com for their announcement. 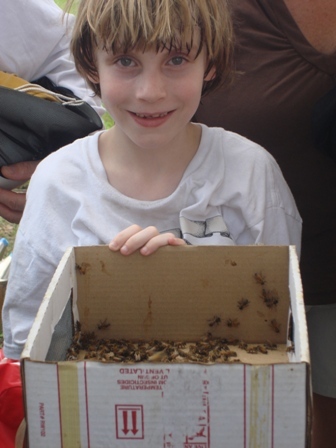 Grayson with a box of bees at the "field day" for the beginning beekeeping class. No fear. The class gave us tons of information about bees. The first three weeks were mostly in a classroom. By the fourth week, we had learned enough in our classroom setting to go into the field with live bees. However, I think most of the class was apprehensive about actually going into a real hive. I was nervous. Grayson says he wasn’t, but I think he was too. It didn’t take long for us to be completely comfortable with bees buzzing all around us. This single experience opened up a whole new world for us. It was instant love… we both fell hard for these amazing creatures. Grayson in the honey house at the monastery. One of our class trips included a visit to Keith Councell’s bee farm at a monastery. Keith is our local bee association president. He comes from a long line of beekeepers in his family (4th generation). I call him the bee whisperer. His knowledge of bees and keeping them in Florida is mind-blowing. His phone rings all day long… non-stop. 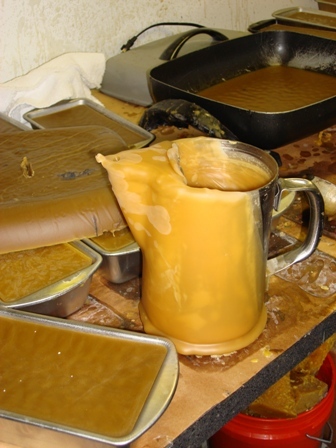 That is beeswax covering everything. 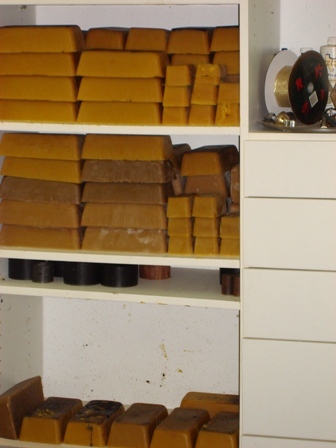 Beeswax before it's melted and molded. Grayson at the monastery learning more about bees from Sister Amanda. The class was fun but it isn’t the only starting point to becoming a beekeeper. Though it was nice being in a group to help us gather the nerve to walk into a cloud of thousands of flying insects for the first time . 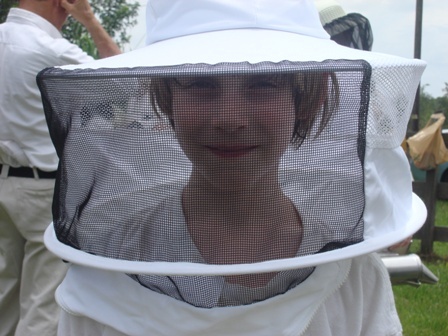 In my opinion, it is most helpful for a beginning beekeeper to join their local bee club. There you will make great friends and learn what others are doing with their bees. Our local bee association has many members that don’t even have their own hives, they just enjoy being a part of the association. Volunteering to help a local beekeeper with their bees is an excellent way to learn with hands-on experience. By the way, Haagen-Dazs is helping with the honey bee crisis. Their website is definitely worth visiting. Don’t skip the videos, they are hilarious. Needless to say, Grayson and I love our bees. We are really looking forward to our honey harvest this year. (Okay, that’s an understatement). Our bees, our honey… what a concept. We will continue to learn how to best tend to our girls and keep them healthy, year after year. There will never come a point where we will feel that we know everything there is to know about bees. It will truly be a lifetime journey. 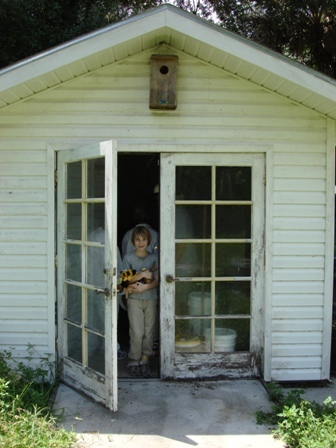 Grayson and I took a beekeeping class at the Lee County agricultural extension office last summer. As a result, we have become avid backyard beekeepers. 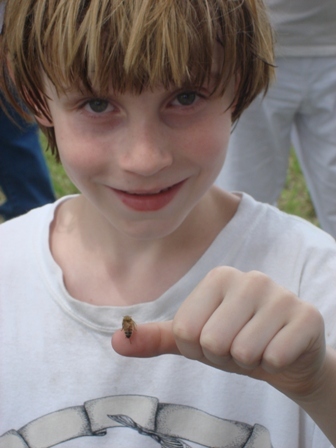 The picture above is Grayson with an Apis mellifera (honeybee) on his thumb. We have two boxes of honeybees and we absolutely adore them. We tend to their needs and we do our best to protect them from harm. 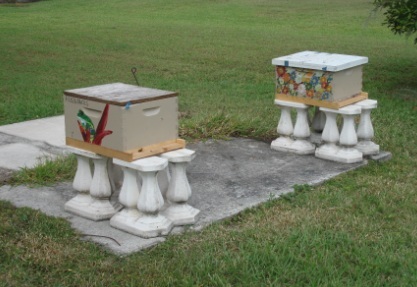 Florida has become a difficult place to keep bees alive. 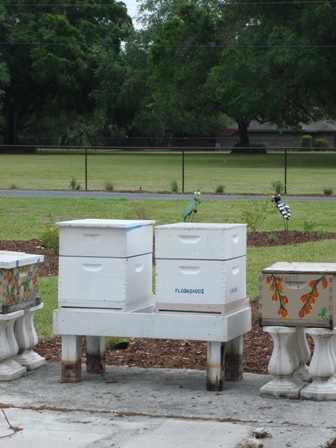 Florida’s beekeeping rules are different from the rest of the country. 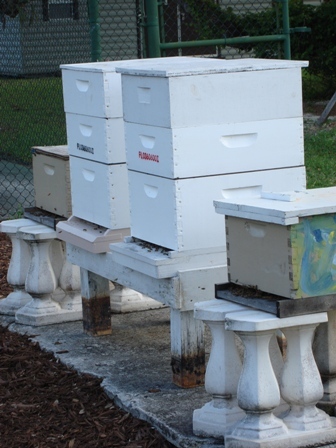 I am eagerly waiting for somebody to write the book on Florida beekeeping. There is so much to discuss when it comes to bees and their keeping. I couldn’t do it in one post. But I will write about our bees frequently as we desperately try to keep our bees alive. Our bee boxes on stands. We lost an entire box of bees several days ago. I believe they were poisoned while out working for the day. There were dead bees everywhere. We are very, very sad about the entire event. I’ve heard people say they were sad when they lost their bees, but I didn’t truly understand the emotion until it happened to us. 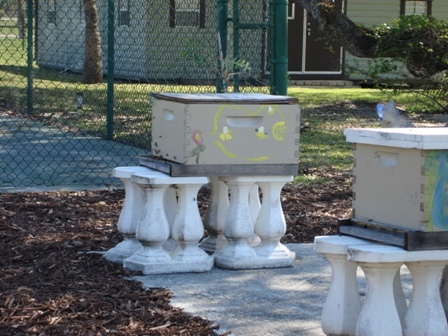 It’s becoming difficult to keep bees alive if you live near a golf course or a citrus grove. The poisons get them eventually. Are you now wondering what those poisons are doing to us? Me too. 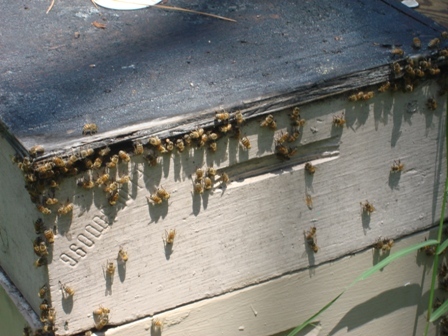 Our other box of bees are lethargic and barely hanging in there. We’re feeding them sugar-water prepared a special way for feeding bees and saying a prayer for them. 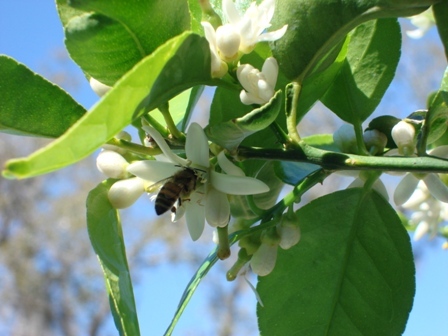 This is one of our girls on our lime blossoms. Our garden has been buzzzzing with activity. These worker bees are out collecting pollen, nectar, water and propolis. 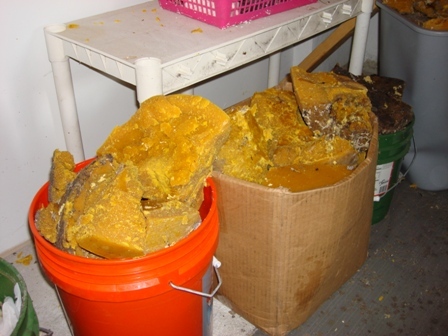 Propolis has wonderful antimicrobial properties. 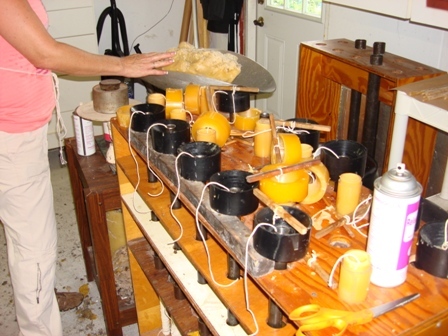 Bees use it to sterilize the hive and fill in cracks. During the bees active season, a colony usually has one queen, several hundred drones (males), and many thousands of workers (females). In the above picture, the queen is marked with a green dot. This is an international queen color code to determine her age. She is also marked so that she is easy to spot when tending the bees. The color green indicates that she is a queen from a year ending with a 4 or 9. Each year has a different color. 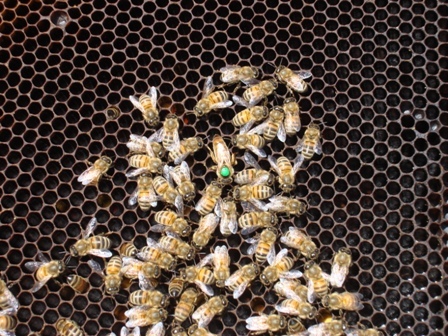 The queen can still be spotted without a colored dot on her as she is larger than the other bees. My colony, in the above picture, is not doing well. If they were, you would see capped brood in the picture. The term brood is used to refer to the embryo or egg, the larva and the pupa stages in the life of holometabolous insects. 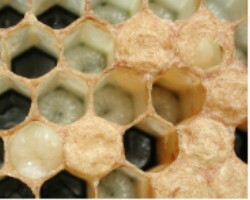 The brood of honeybees develops within a bee hive box. 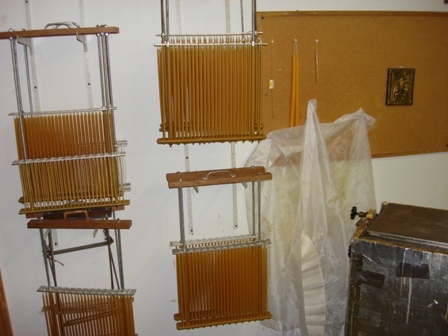 If all goes well, this is the honey harvest you can expect at the end of the season. Most backyard beekeepers get much, much more than this. 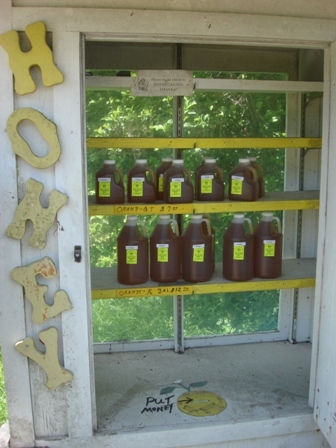 This is a local honey stand, at the end of the beekeeper’s driveway, that is not far from us. We bought our honey here for years before we became beekeepers. They use the honor system. You choose your honey and put the proper amount into the money slot. Unfortunately, for the first time in history, beekeepers everywhere are giving up… at an alarming rate . They are not able to keep their bees alive. Since beekeeping is not our livelihood and only a backyard hobby for us, we will not give up…yet.